Be sure to register in our forums! Share your opinions, help others, and enter our contests. HTC HD7 Review: Ready to Take On the iPhone? Really! This may seem like a silly thing to get excited about, but I actually quite like having the one-tap access to various emoticons on current Windows Phone 7 devices. I tend to be one of those "emoticon" people, and having access to more of them will be great. I do wonder though how good they'll translate across other devices. 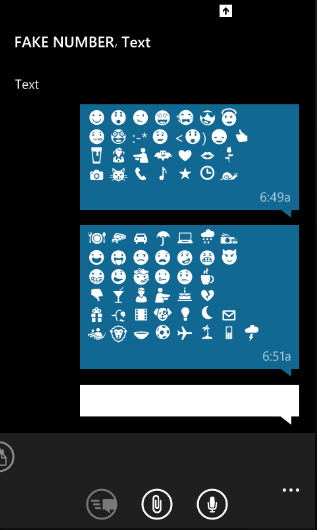 Some of the emoticons above look like Wingding font icons, so I wonder if many of these will only work in a Mango to Mango phone scenario. Brad Wasson: Do Apps Look Better On iOS or Windows Phone? Brad Wasson: Positive Windows Phone News From China? Brad Wasson: A Sign Of Improving Times For Windows Phone?